My first round of golf with my own clubs came when I was 15. I had been to driving ranges numerous times, listened to my dad and other family members talk about the game, and I grew up at the beginning of Tiger Woods’ stranglehold over not only the game, but the entire sporting world. I remember watching him and 19-year old Sergio Garcia go head to head at Medinah in 1999 and being mesmerized. I wanted to play, and when I got those clubs (a starter set of Virage’s) I couldn’t have been more excited. Then I got out there. I was terrible, and worse yet, I had absolutely zero patience for the game. I played every sport growing up, and was actually pretty good at most of them, but I couldn’t get the hang of golf and my temper on the course couldn’t be contained. Throwing clubs, swearing, taking chunks out of the ground after bad shots; you name it, I did it. There’s a reason I’m on my fourth putter entering my tenth year of play. I know that Lydia Ko started playing much earlier than myself, but watching her play the professional game with ease at 15 is astonishing. Of course, she isn’t the first teenager to come along and hang with the adults. She has said on numerous occasions that Michelle Wie is her idol, and Lexi Thompson has had some success as well, with three wins on her resume at only 18 years old, but Ko is better than both of them. The idea that someone could be this good at 15, both physically and mentally, is still a bit of a shock to the system. She picked up her third win in a professional event last week in New Zealand, which combined with her two wins last year, has moved her to 30th in the world rankings, and given her one more professional win than Wie. Granted, it probably says something about the state of the women’s professional game that a 15-year old amateur can be ranked that high, but there’s no denying her talent, which was on display again yesterday. This week, she joined the field for the opening event of the 2013 LPGA season, the ISPS Handa Women’s Australian Open at Royal Canberra. 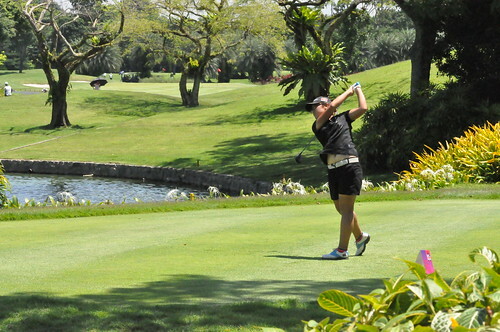 She was paired with Wie and World Number One Yani Tseng. Ko opened with a first-round 63, and currently sits with a one-shot lead. Several outlets, including Golf Channel, simply led with the “I have no advice for her” line, and left it at that. I think if Wie was being honest about the whole thing, she would have changed up how her turning pro was handled, but there’s nothing wrong with what she said. What else is she supposed to say? If she comes out and says she should or shouldn’t turn pro, she gets ripped into for that comment as well. In any event, the story won’t be going away anytime soon. If there’s anything that we’ve learned from paying attention to golf in recent years, it’s that no matter the age of the player, you can find success at the pro level. Whether it’s Thompson and Ko, or Phil Mickelson and Ernie Els, the age of the player has no bearing, positively or negatively on the outcome. My one hope in this case is that we don’t get obsessed with comparing Ko to other players. Don’t focus on saying she’s the next Sorenstam or Woods or whoever, just let her play and enjoy the fact that we are watching a really talented player, regardless of age.